While we often focus on the uses of glue guns, we thought it was important to talk about how to keep your glue guns running efficiently. Maintenance might seem like it’s a lot of work, but our guide should show you just how easy it is to maintain your glue gun at its top capacity. There are a few general tips that will allow your glue gun to remain functional and effective. It’s highly important to NEVER lay the applicator on its side – many models come with stands, and stands for bench mounting are also available. The Tec silicone drip mat is also useful here, preventing damage to the work surface. It’s also important to unplug the applicator if it’s not going to be used for more than 40 minutes. Glue guns are fitted with pre-set heaters that constantly melt the adhesive, so if they’re not being used, the molten adhesive may char or block the nozzle. Not only can this block the glue gun and affect usage, but can leave you at risk of burns with possible back-up. This is really important for the longevity of your glue gun. You should never remove the nozzle from a cold applicator – this can lead to thread damage. Remove the nozzle when warm, making sure to wear protective gloves. You should also wipe any excess molten glue from around the nozzle at the end of each work session, as this helps avoid build up of glue deposits. Again, this should be done while the applicator is still hot – and don’t forget your protective gloves. If hardened glue does build up and block the nozzle, there are a number of products to help you. Most notably, Melt-O-Clean hot melt cleaner is able to remove residual and charred adhesive, as well as heavy grease and grime. It’s easy to use and environmentally friendly too, so it’s a priceless tool for your glue gun and work surface maintenance. It’s really important to take good care of your glue guns. Before putting your gun away and to aid easier start up the next time the applicator is used, disconnect from the power supply when work is complete and while the tool is cooling extrude about half a cartridge / stick of molten glue through the applicator. Always wipe any excess molten glue from around the nozzle at the end of each work session. This will avoid build-up of glue deposits which can char. This should be done while the applicator is still hot and always wear protective gloves. It’s important to always insert the glue stick into the applicator BEFORE plugging in. Most applicators are ready to use in 3-5 minutes, though spray applicators should be allowed to heat up for at least 10. 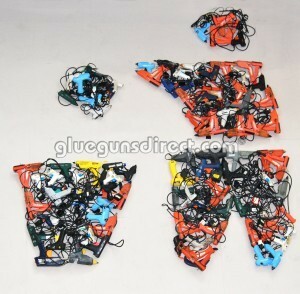 You should never withdraw a part melted glue stick through the back of the gun, as this can cause damage to your gun. You should always choose your Tec glue gun according to the kind of glue being used, the dispensing rate you need and the nature of your project. Hot Melt glue guns cover the majority of Tecbond glue stick formulations, which offer a wider range of options for bonding. Low Melt glue sticks operate at a lower temperature and are therefore safer to use, as risk of burns are reduced. However, Low Melt glue sticks only come in a selected range and are usually used for bonding heat sensitive materials like polystyrene and foam. You should never use Tecbond Low Melt glue sticks in a hot melt glue gun (or hot melt glue sticks in a low melt glue gun) unless specifically directed by a member of the GlueGunsDirect team. Have an old or broken glue gun? Don’t throw it, exchange it for a new Tec glue gun with a 12 month warranty at a discounted price.